My place is so full that for every record I buy, I have to get rid of another one. Yesterday I came home with a large pile of vinyl in all formats, so today I will spend listening to records that are on my list of falling of the shelf, trying to find 25 records that are really not worth keeping. This is very difficult: every song that I listen to with full attention, opens up to my ears and turns into something unique. There are hardly any records that I do not like. 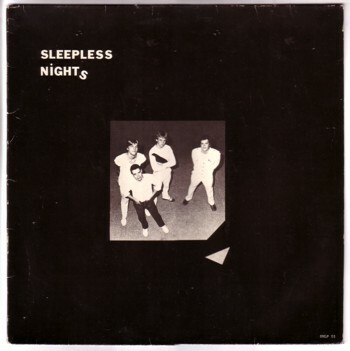 Among the vinyl I bought yesterday is a private LP from Sleepless Nights, a band from Katwijk, a former fishers town in Holland. The LP was made in 1980, not exactly my favourite era. The music is very much the sort of postpunkpopwithabitofska that was popular in those days. But when I listened to the lyrics last night, I realised this record is never going to leave this place. For Dutch (and probably other European) people the lyrics of most American songs sound absurd if you translate them into Dutch. Especially the love songs. This is very difficult to explain to Americans, because they have grown up with these totally unrealistic love lyrics. Nobody talks like that! The language used in love songs has sung itself loose from the way that people really talk and think. For foreigners this is easier to hear, although the media brainwash has done its work here too. 75% of the songs in the Top 40 are fairytales about love relations that have no relation whatsoever with real life. Well, let me speak for myself: my life is for 90% about doing the dishes, eating, visiting supermarkets and toilets, fighting with my kids and things like that. Listening to an hour of hit songs feels like visiting another planet to me! If Dutch people write English songs, you can hear lyrics that are far more realistic and original than what you usually hear on the radio. But because there are so little songs with original and realistic texts, these songs sound weird! It is the world completely upside down. To illustrate this story I choose the openings track of the LP, Big girl now . It is about a girl having her first periods. A very important subject in real life, but this is the first time I heard a pop song about it.